Raise your hand if you have a kid that just can’t get into breakfast. You beg, you plead, you guilt trip and still nothing. They are perfectly content to go through the whole morning without eating. Thanks to our “revised” gastrointestinal systems we know that the body can go long periods of time without food, but for kids especially breakfast is important. It helps them have the energy they need to power arguably the most important organ in the human body: the brain! My youngest daughter was that kind of kid. She would often skip breakfast, mostly because she isn’t a big meat eater and cereal got boring after a while. But she does like protein shakes. In fact, she went with me to the gym this weekend and, as we were leaving, asked for a shake. 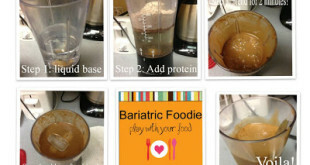 I grudgingly forked over about $6 for the very same shake recipe I share below. But I would say it was still worth it because I have finally, FINALLY found something the child will consume for breakfast that is not a doughnut! WARNING: This shake is not for you, post-ops! Especially if you have reactive hypoglycemia or, like me, are simply prone to “very special moments” when too many carbs are playing in the playground. Kids, though? They need carbs. Good carbs. And good fat. And a good bit of protein, making this a great shake for your kid. You? You may have a sip. Maybe two. But then proceed DIRECTLY to the 2nd shake recipe!!! Combine everything EXCEPT protein and ice in your blender until well mixed. Add protein and ice and blend again until smooth. Serve in a glass and try not to sip!!! It’s not for you!!! The picture at the top is this protein shake in my daughters re-usable travel cup. I made it in the morning, she sipped while she dressed and took it straight out the door with her. Lovely! 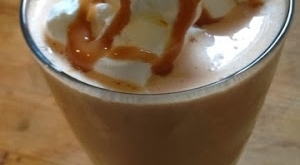 Now for you…it’s been a LONG time since I’ve done a new protein shake recipe. There are so many on this blog already (and even MORE than in that link, which I’m working on updating) that I have an extensive list from which to choose. 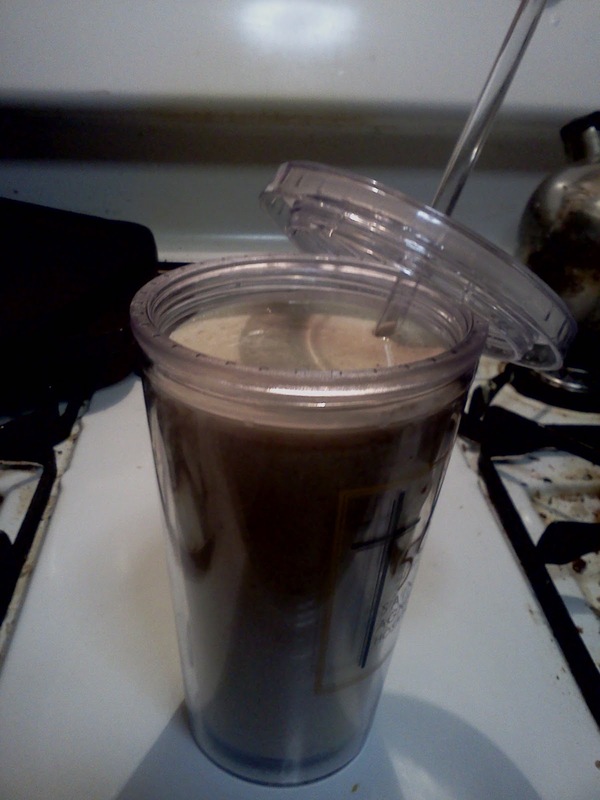 This shake was, as so many are, a result of having to use what I had on hand at the moment. The results were very yummy. Blend according to the Triple X Method. Or not. Your choice. This is definitely a blender recipe though. A shaker cup would not work well! Way too funny – I was just about to send you the recipe for my PB&J shake, which is very similar yup this, but I was waiting to check and see if you already have one. I too had the same surgery as you the year before you. I lost 210 pounds and kept it off for until 2012 when I lost my job of 23 years and was unemployed for a year before finding another. I let myself gain 105 pounds over time and now am 2 months into trying to get it back off. I’m finding the road hard but it took me time to get here and will take me time to get back where I want to be. I never reached my goal and I want to do that. I stumbled upon your book and I’m hoping to find more inspiration from you and your followers, thx and keep up the good work. People like me need people like you!